* numerous charts and illustrations. Reflecting the latest demographic information and covering the developmental spectrum from pediatric to geriatric, this landmark Handbook will become an indispensable reference tool for clinicians and researchers alike. Contents: M.O. Pontón, J. León-Carrión, The Hispanic Population in the United States: An Overview of Sociocultural and Demographic Issues. M.O. Pontón, Hispanic Culture in the United States. M.O. Pontón, Research and Assessment Issues With Hispanic Populations. E.C. Cascallar, J. Arnold, Second Language Acquisition. J.G. Centeno, L.K. Obler, Bilingualism Principles. A. Ardila, Acquired Language Disorders. J.J. Gonzalez, Pediatric Assessment. R.W. Woodcock, A.F. Muñoz-Sandoval, The Bacteria-R in Neuropsychological Assessment. M.A. Sedó, LDs in Urban Hispanic Students: A Neuropsychological Framework. C.G. Armengol-De la Miyar, Organic Behavioral Problems and Social Skills in Children. A.M. Llorente, C.M. LoPresti, J.K. Levy, F. Fernandez, Neurobehavioral and Neuropsychological Manifestations of HIV-1 Infection: Assessment Considerations With Hispanic Populations. J. León-Carrión, Neurobehavioral Disorders. P.D. Patrick, J. León-Carrión, Mood and Organic Personality Disorder Following Brain Injury. M.O. 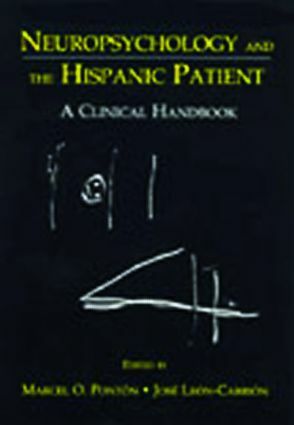 Pontón, I. Monguió, Rehabilitation of Brain Injury Among Hispanic Patients. F. Melendez, Forensic Assessment of Hispanics. M. Rosselli, A. Ardila, Normal and Abnormal Aging. I.M. Taussig, Dementias: Participation of Hispanic Patients in Research Programs.